Lorin and Troy were thrown a curveball early on in their wedding planning and they had to change their date, I was very lucky to come on board as their celebrant when their plans took shape for their ceremony at the beautiful and private Panton Vineyard, Red Hill. My oh my it was a magnificent ceremony, they truly invested themselves in working with me to create a ceremony that reflected their personalities and their love for one another. It had everything, an emotional walk down the aisle, a beautiful moment with all of their parents as they stood together eagerly waiting to be married. I loved retelling their story, there were cheers punctuated with laughter, their vows were personal and poignant and my very favourite moment came when we took a few minutes to sign the legal certificates with their Grandmother’s as their witnesses. There is something very special about having close family members witness your signatures on your marriage certificate. Lorin and Troy’s reception at The Epicurean Red Hill would have been spectacular; they were surrounded by all of their favourite people and I just know the celebrations would have gone long into the night!! I am such a big fan of relaxed people who are planning a cracking party to celebrate their love. Carolyn and Mark were doing exactly that and they picked the perfect beach side setting at Blairgowrie Yacht Squadron. Carolyn was a little late, as she wasn’t going to miss watching her footy team, St Kilda win their game! Once the ceremony got underway she absolutely stole the show in her stunning gown. There were plenty of laughs and right as we came to the ‘serious’ part Mark was completely blinded by the sun appearing for the first time that afternoon. Lucky his fabulous bride provided the perfect shade so he could get through his vows. Congratulations Mr and Mrs Bell, you absolute legends! Tanglewood Estate - Even the lake is heart shaped! Abby and Kade tied the knot at fabulous Tanglewood Estate on the most perfect summer day. Their ceremony was relaxed and punctuated with laughter – my favourite kind! They met and knew each other through high school but nothing romantic eventuated until a few years after they graduated. They have created a beautiful life together with their gorgeous daughter and much loved fur baby and their wedding was the perfect way to celebrate the awesome future they have to look forward to. 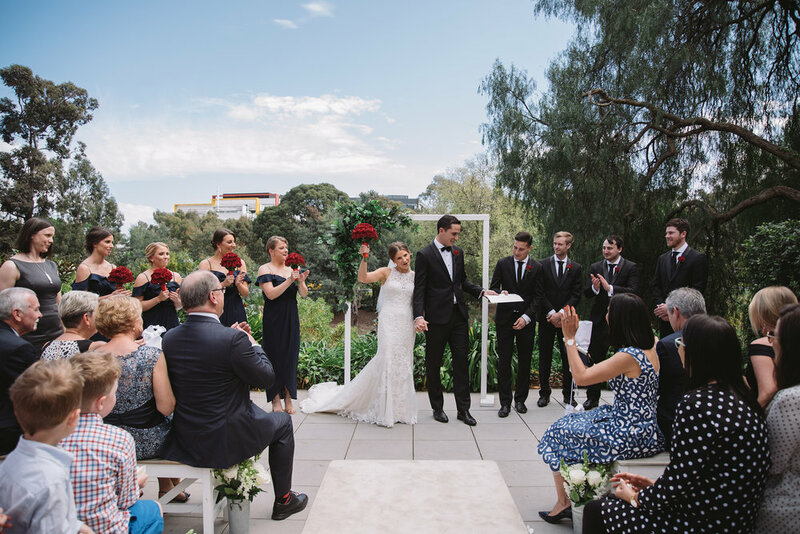 Sheer joy and spontaneous applause are the two things that spring to mind when I think of Camilla and Damien’s wedding ceremony on a sunny but very windy day at the Beaumaris Motor Yacht Squadron. From the moment the six flower girls began walking down the aisle, I knew we were in for an awesome celebration of Camilla & Damien’s love. The guests greeted each flower girl with such delight and these fabulous bursts of applause continued right throughout the ceremony. There was just so much love and support for this gorgeous couple from all their family and friends and the feeling in the air was indescribable and something that will always stay with me. Inglewood Estate Chapel played host to Alan and Leah’s beautiful wedding ceremony. As a proud Scotsman, Alan and Best Man Luke (Leah’s Brother) were clad in traditional Scottish wear and they looked fabulous! 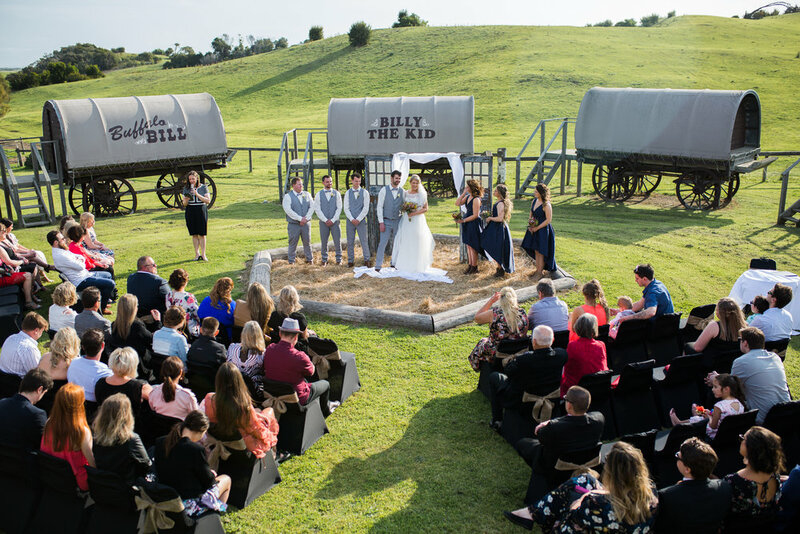 A feeling of anticipation was evident as we waited for Leah to arrive, as she walked down the aisle the atmosphere relaxed and there were many smiles from the bride, groom and their guests as they stood together flanked by their siblings. From the beginning they had a vision of creating wedding day that celebrated their love for one another, their passion for travel and their amazing family and friends. There was no question they achieved all those things throughout their magnificent wedding celebrations. Campbell Point House was the perfect backdrop for the stunningly elegant wedding celebrations created by Megan and Aidan. 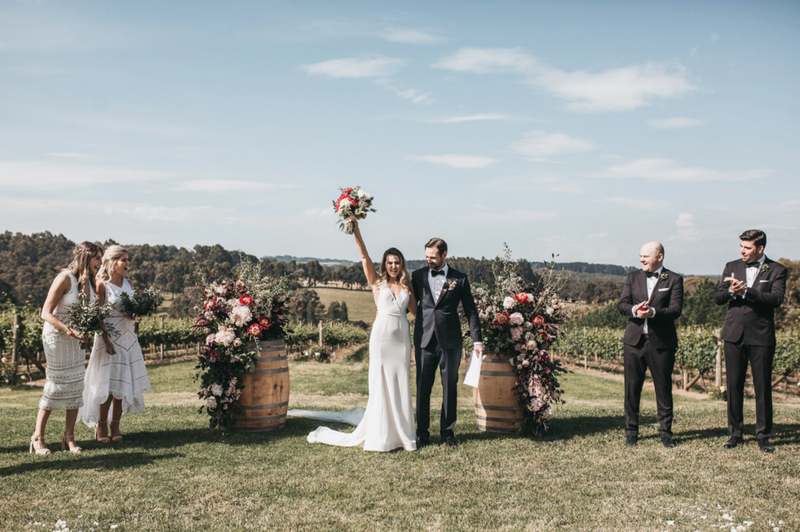 Based in Perth, this fun and relaxed couple organised their entire wedding from the other side of the country and all of their guests flew in to enjoy the celebrations on the Victorian Bellarine and surf coast. You can’t help but we in awe of the surrounds but Megan certainly stole the show when she made her entrance down the grand stairs to her eagerly awaited groom. Telling the story of how they first met and when Megan knew Aidan was someone special (a dropped bottle of aftershave!) brought laughter from their family and friends. ‘All you need is Love’ by The Beatles was the perfect song to end the ceremony as everyone showered the fabulous newlyweds with beautiful congratulations.